The “Kling Street Kids” is a group of kids (ages 5 – 17) living in and around Toluca Lake, California, who started raising money for children’s charities in 2002. From 2002 through 2017, over $200,000 has been raised and donated, primarily to Children’s Hospital Los Angeles. Kling Street Kids is not a formal organization, but a grass-roots neighborhood group of over 60 kids and is growing every year. We always register with the City of Los Angeles Police Commission which allows us to solicit donations. If you are interested in joining or getting involved in any way (either as a volunteer or a sponsor), please contact us. In 17 years, the KLING STREET KIDS have provided over $208,754.55 to other kids who are in need. Callie & Cady (then ages 9 & 7) – two sisters living on Kling Street in Toluca Lake, California had an idea. They wanted to hold a holiday fundraiser and give whatever they made to other children who may not be as fortunate as they are at Christmas time. They asked their twin neighbors across the street, Libby & Grady (ages 8), if they wanted to help. Together, the quartet formed “The Kling Street Kids” in December of 2002. The Kling Street Kids started by selling coffee, doughnuts, hot chocolate, pizza and handmade reindeer ornaments outside their homes the mornings of December 23 & 24. Through the generosity of their neighborhood and the local Starbucks of Toluca Lake, they raised $549.57 that they donated as a Christmas present to the Los Angeles Chapter of Make-A-Wish. In 2003, they made their efforts an annual event and got Krispy Kremeand Trader Joe’s to join Starbucks as sponsors. They expanded their sales efforts by holding an outdoor free screening of “How the Grinch Stole Christmas”. The kids nearly quadrupled their first year’s efforts and raised $2,065.47 that they donated to Children’s Hospital Los Angeles. In 2004, they increased their reach by including some additional Toluca Lake businesses (most notably Pergolinaand Prosecco Restaurant) as their sponsors in addition to Starbucks, Krispy Kreme and Trader Joe’s. Oliver Holt Christmas Trees even donated a tree to display their handmade reindeer ornaments. Callie & Cady’s next-door neighbor and classmate, Khoe (then age 12), joined the Kling Street Kids to help them in their efforts. Together, they broke their record in the first day and donated $3,001.04 to Children’s Hospital Los Angeles in addition to 156 boxes of cookies from Cady’s Girl Scout Troup. In 2005, co-founders Grady & Libby moved to North Carolina but 2 other neighbors, Mary (7th grade) and Paul (2nd grade) joined the Kling Street Kids. New as sponsors were Vonssupermarket and Ty, Inc (makers of Beanie Babies stuffed toys). The girls sold the Beanie Babies for adoption and all 102 of them were delivered at 3:00 pm on December 24th to the kids spending Christmas Eve in the hospital. The local CBS2 and KCAL9 news actually did a special story on the success of the Kling Street Kids, and the response was overwhelming, resulting in their biggest success to date with $6,216.75 going directly to Children’s Hospital Los Angeles. In 2006, their motto “KIDS HELPING KIDS” really held true as children from streets all over Toluca Lake joined in to make it a smashing success. The volunteers grew from 5 members to 15 representing 4 other streets in Toluca Lake. They also had enormous help from outside the area from kids in both Burbank and Pasadena! New members were Grace (3), Megan, Chris & Katie, Lindsay, Philip & Christina, McKenzie & Spencer, Molly, Nicole and Kendall. Starbucks, Trader Joe’s, Pergolina, and Prosecco were back again, but new sponsors were FedEx Kinkos, Cinema Secrets, Fast Frame, The Magnolia Grill and Sweet Life. Another new addition this year was the radio station KISS FM. They generously promoted and provided music and free give-aways for the event. On Christmas Eve, the adopted stuffed animals and lots of cookies and cakes were delivered again to the nurses and patients in Children’s Hospital. When the kids returned home, 10 tons of snow was delivered in their Toluca Lake neighborhood so that all the volunteers could enjoy a white Christmas! Also in 2006, they began the BEAT THE STREET campaign challenging and then tallying the Most Generous TOP 10 STREETS of Toluca Lake who contributed to their record breaking success of $10,015.02! 2007 grew even more with a record 25 kids joining in (Courtney, Sophia, Sara, Analisa, Kate, Emmy & Tess were new to the group this year). Ty Beanie Babies again donated 324 Beanie Babies that the Kling Street Kids “adopted” for the kids spending Christmas Eve in the hospital. Together they raised a record $12,577.26 for Children’s Hospital Los Angeles. 2008 was another successful year, despite the downturn in the economy. KIIS-FM was back, the Beanie Baby adoption, the silent auction, the snow, and most of our sponsors including new Toluca Lake businesses who joined in our campaign right inside their stores. Six new kids from the area joined the group – including 5-year-old Sophia who joined by completely emptying out both of her piggy banks. Together, $10,368.50 was raised for the hospital. The Kling Street Kids were out in force during the Toluca Lake Holiday Open House to launch the December long campaign in 2009. Radio Disney & KIISfm were back as sponsors along with Starbucks, Trader Joes, The Magnolia Grille, FedEx Kinkos, Pergolina, Fast Frame, Lakeside Car Wash, The Packaging Store, Toluca Tots, Tamara Dahill, The UPS Store, Toyota, Paty’s and Eleanors Barber Shop. 2009 brought in an additional $10,893.20. The 9th Annual Event in 2010 was a remarkable milestone for The Kling Street Kids. Union Ice, Jellycats, Flowers Talk, Franks restaurant, Mucho Mas restaurant, Sharky’s Red Barn Seed & Saddlery & Milt & Edie’s Drycleaning were added as the newest sponsors and The Kling Street Kids membership grew to over 65 members. Holiday Glitter Tattoos were also added as a popular draw to the event. In addition to the toys and 156 “adopted” Beanie Babies that were brought to the hospital on Christmas Eve, the group brought in a staggering $21,178.01 for Children’s Hospital Los Angeles! In addition, the tragic passing of the c0-founders Callie & Cady’s beloved mother, Michelle Nicastro, also brought in an additional round of donations on top of that in honor of Michelle & the Kling Street Kids. The 10th Annual 2011 Event was scheduled again for December 23 & 24th on Kling Street. The Beanie Babies were back, along with the Incredible Silent Auction Items and lots more. Due to the growing group of kid volunteers from streets all over the area, the Kling Street Kids adapted their name this year to become “MY SWEET STREET – The Kling Street Kids” since the organization has grown way beyond Kling Street since it’s inception in 2002. Sponsors included Starbucks, Trader Joes, Toyota, Radio Dsiney, The UPS Store, Jellycat Inc., Red Barn Seed & Saddlery, Pillow Pets, Hearts 4 Hearts Girls, Hotel Amarano, Arde’s Bistro, Bob’s Big Boy, The Counter, Dr. Meredith Duncan, Dylan Keith Salon, Honeybaked Ham, IHSC, Menchies, Mindfulnest, Mo’s, Moksha Yoga LA, NAil Garden, Red Door Lounge, Robanos, Sharky’s, 360 Fitness, the Toluca Lake Tennis Club, KIISfm and the Tolucan. All together, $18,071.14 was raised bringing the total raised in 10 years to $94,935.96!! The 11th Annual Event was held again in 2012 and represented a milestone raising $16,951.64 allowing the kids to surpass the $100,000 mark with a total of $111,887.60. A photo booth was added this year and in addition to our regular sponsors, we added these sponsors: Beauty by Gaby, Be The Change Medi-Spa, Marnie Cooper Acting School, Dove’s Bodies, Stefani Hemphill, MPT, Malbec, McPhee International Studios, Roclord Studio Photography, The Sports Center & Warner Horizon. The 12th Annual Event was celebrated in 2013 and it represented the last Kling Street Kids with the original founders before Cady went off to college (having started when she was just 7 years old). Milt & Edie’s & Funxional Fitness joined as sponsors and Radio Disney was back again. Another $18,630.84 was raised which brought the overall total to $130,518.44 that has gone directly to Children’s Hospital Los Angeles. In 2014, the 13th Annual Event took place despite Callie & Cady both being in college at U.S.C. It was a reunion for many of the kids while a whole new group of kids signed on to join up to continue the tradition. The ten tons of snow, Starbucks, Pillow Pets, Toyota, The UPS Store, Red Barn Seed & Saddlery, Hotel Amarano, Sharky’s Toluca Lake Tennis & Fitness, Menchies, Milt & Edies Drycleaners, Tamara Dahill, The Sweat Shoppe, The Spa on Rodeo, Himalaya Sun all generously sponsored the event. 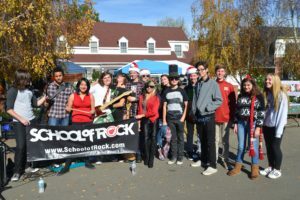 New this year was a bounce house sponsored by one of our new Kling Street neighbors and The School of Rock in Burbank came to entertain during the 23rd! The whole affair was featured in the Daily News, followed by a presentation from the City of Los Angeles from Councilman Tom LaBonge and then Fritz Coleman did an incredible story on the event on KNBC two days before. Once again, the kids dropped hundreds of adopted Pillow Pets and toys off at Children’s Hospital Los Angeles in time for Christmas. After they wrapped, an additional $14,179.03was presented to the hospital bringing the 13 year total to $144,967.47. Was a huge success as new families threw their time and talent towards the event. In addition to our first ever bounce houses, all of the popular attractions were back and an incredible performance by School of Rock plus 2 beautiful days, brought the fundraising efforts to the 2nd highest in our history. $20,457.37 bringing the 14 year total to $165,424.84! And 3 new families took the reigns from the original founders as they both had graduated to college and needed the help. Despite a rainy first day, along with the snow, delicious treats, face painters, glitter tattoos, Pillow Pet Adoption and the largest silent auction ever created, the event also featured art classes, balloon animals, bubble magic, a petting zoo, pony rides, Los Angeles Fire Truck tours and the first ever, Christmas Train down Kling Street. $16,607.11 was raised from the event bringing the 15 year total to $182,031.95!. 2017 marked the 16th Annual Event which proved to be the most successful and highly attended event EVER in the history of The Kling Street Kids! More families rolled up their sleeves and the event was held on one day (December 23) instead of 2 days where the city closed off the block to make it an actual street fair for the hundreds who attended. In addition to the 10 tons of snow for sledding, a spectacular silent auction, delicious and bountiful drinks, food and treats, the Fire Department brought back one of their units for the kids to explore, a popular photo booth was added, along with a video game truck, a snow cone maker, a balloon maker, a holiday train, School of Rock performances and of course the Pillow Pet adoption all of whom found a home when they were delivered to Children’s Hospital Los Angeles on Christmas Eve. A remarkable $26,627.60 was raised in 2017 which brings the Kling Street Kids to a total of $208,659.55 in 16 years. Thank you everyone who made this happen. Donations are already coming in for the highly anticipated 2018 event and we hope to see you there. Children's Hospital Los Angeles (CHLA) is a 501(c)(3) nonprofit institution that provides pediatric health care and helps our patients more than 528,000 times each year in a setting designed just for their needs. Our history began in 1901 in a small house on the corner of Alpine and Castelar Streets (now Hill St. in Chinatown) and today our medical experts offer more than 350 pediatric specialty programs and services to meet the needs of our patients. CHLA is a provider of more than $232.6 million in community benefits annually to children and families. As the first and largest pediatric hospital in Southern California, CHLA relies on the generosity of philanthropists in the community to support compassionate patient care, leading-edge education of the caregivers of tomorrow and innovative research efforts that impact children at our hospital and around the world. Many local retailers, restaurants and companies generously contribute to the Kling Street Kids’ efforts. We thank all the previous, current and future sponsors. We couldn't do it without you!